Staying fashionable's expensive, unless you're a doctor, in which case all you need is a "Trust Me, I'm a Doctor" t-shirt, and possibly some sort of pants. Renew your wardrobe for less, at The Low Down at Bloomingdale's SoHo, September 16th-19th. This fall gear-stravaganza gives guys the chance to score the finest selections from Bloomingdale's Denim, Trend, and Sportswear collections -- and the more you buy, the more you save. From peacoats, to bombers, to pullover sweaters, the season augments Americana with rustic international influences, for a "Nordic fisherman meets grunge" look that achieves dashing handsomeness without the smell of teen spirit, or lutefisk. 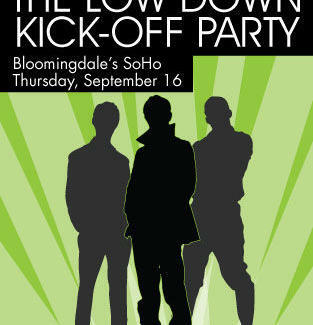 To start the sale off right, hit Thrillist & Bloomingdale's Low Down Kick-Off Party, Thursday, September 16th from 6-8pm. RSVP at thrillist.com/thelowdown for discounts, complimentary hemming on jeans, tunes curated by DJ Tanner, gratis blue "jean" themed WODKA Vodka cocktails, and, if you spend $250+, a free Fydelity Stereobag -- the perfect gift for the musician who lives in your family's basement, and's always wearing a t-shirt that says, "Trust Me, I'm John Stamos."